Who’s The Favorite And Who’s A Sleeper In The English Premier League? If you’re not rooting for Manchester City, this probably isn’t your year. Get used to the sight of Riyad Mahrez in Manchester City blue. This imbalance shouldn’t come as a shock: Aside from Blackburn Rovers in 1994-95 and Leicester City in 2015-16, only four teams have won the Premier League since its inception in 1992-93. And if you look at the table for every Premier League season — especially for the past decade — the top six spots are more likely than not occupied by some or all of the same six teams currently ranked in the world top 15. 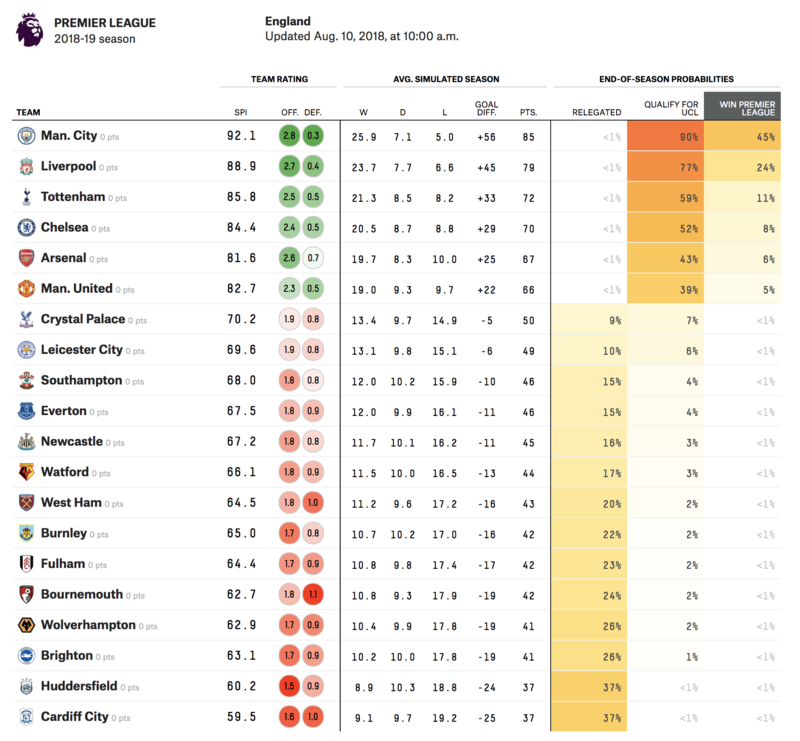 If you’re hoping that the upcoming season will offer some vicissitude at the top of the table, don’t hold your breath: According to our Premier League predictions, Manchester City is a good bet to repeat as champions. And the five spaces below the Citizens will likely be occupied by — you guessed it! — Liverpool, Tottenham, Chelsea, Arsenal and Manchester United. After we ran 20,000 simulated seasons, the closest any team got to the top six was Crystal Palace — still 16 points off the pace. The top six teams in the Premier League are among the richest sports franchises on earth. All that money means they can afford to pay often ludicrous fees to attract the world’s best players. Money turns into results in major competitions, and results in major competitions turn into more money. And that new money turns into the buying of yet more of the world’s best players, and the top six feedback loop endures. Let’s look at how each of the top six teams — and a few others — spent this summer, and what it means for their chances at winning the Premier League title. Liverpool paid a then-record fee for 25-year-old Brazilian goalkeeper Alisson Becker, who led the Italian Serie A in save percentage per 90 minutes during his first year as Roma’s No. 1. He wasn’t at his best during the World Cup, but Liverpool is hoping that if given the chance in a big situation, Alisson will perform better than Loris Karius did. Liverpool also added Guinean midfielder Naby Keita, Brazilian midfielder Fabinho and Swiss winger Xherdan Shaqiri, making its total spend the largest in England. Adding a defensive-minded midfielder like Fabinho and a world-class keeper like Alisson should help bolster a Liverpool defense that, at times, left something to be desired during the 2017-18 campaign — and it should give the Reds a real shot at challenging for the title. It seems impossible, but defending champion Manchester City also got better, finally landing longtime target Riyad Mahrez. It’s not clear where the former Leicester City maestro will play — Leroy Sané, Raheem Sterling and Bernardo Silva did a pretty good job patrolling the wings last season, after all — but it never hurts to have a winger on your squad who’s proven he can score 15 goals and assist on 10 more. Not a bad pickup for a team that broke the all-time Premier League goal record a season ago. Despite the departure of longterm manager Arsene Wenger, hopes must be high in Highbury: Arsenal found a potential replacement for the aging Petr Cech in German keeper Bernd Leno, and the addition of Uruguayan holding midfielder Lucas Torreira should help shore up its defense, which conceded the most goals of any of the top six squads last season. Fan favorite Jack Wilshere departed for West Ham United, but injury issues have long relegated him to “could have been” status anyway. Everton hasn’t finished inside the top six since 2013-14, but Toffee fans will be pleased with their team’s transfer window successes. The club paid Watford a lot of money for the swift and tricky Brazilian winger Richarlison,2 and also added French wingback Lucas Digne. If Evertonians were displeased with the park-the-bus soccer employed by Big Sam Allardyce, they should be happy that this year’s squad will feature some players who like to go forward. Signing Colombian center back and World Cup standout Yerry Mina means they won’t suffer at the back, either. Everton will probably still finish between seventh and 10th, but it should look better doing so. Who stayed mostly the same? Manchester United is hoping to unseat rivals Manchester City and win its first title since 2013,3 but it faces one problem: The Red Devils didn’t do much during the transfer window. Portuguese right back Diogo Dalot might be the eventual heir apparent to captain Antonio Valencia, but at the tender age of 19 years old — and with just six first-team starts for Portuguese club Porto — he doesn’t transform United into champions from also-rans. Former Shakhtar Donetsk midfielder and Seleção member Fred should help in the center of the pitch — he is equally capable of going forward and dropping back behind his midfield partners to help in defense, and he can play with both feet — but his high price tag carries an intense weight of expectation. Ask Paul Pogba4 how that plays in Manchester. Who stayed mostly the same but feels worse? The boys from White Hart Lane spent zero dollars during the transfer window. Tottenham wanted midfielder Jack Grealish but ultimately couldn’t come to terms with Aston Villa. Spurs don’t really need Grealish — they had the second best possession rate per 90 minutes in the middle third in 2017-18 — but their depth may be a problem, particularly at the start of the season. Meanwhile, Chelsea experienced one of the most tumultuous summers in recent memory — which is saying a lot, given owner Roman Abramovich’s apparent penchant for drama. Manager Antonio Conte got the sack despite delivering a championship in 2016-17, and truant goalkeeper Thibaut Courtois forced a sale to Real Madrid. The Blues better hope that Kepa Arrizabalaga, for whom they paid a now-record fee for a keeper, is ready for the Premier League grind. Otherwise they may be forced to rely on this guy. This will be the first season since 2012-135 that Leicester City will be without Mahrez, which means that the Foxes probaby stand little chance to repeat their unlikely 2015-16 run to the Premier League title. While Leicester still has goal poacher Jamie Vardy, it failed to re-sign Nigerian striker Ahmed Musa (who, by the way, had a very good World Cup). James Maddison is a nice signing and should make up for some of the offense lost with Mahrez’s departure, but don’t expect another Cinderella run from the Foxes. The woes of Newcastle United start and end with its agreement to a permanent deal that sent its best option at forward, Aleksandar Mitrovic, to newly promoted Fulham. The Magpies must be hoping that the strike trio of Matt Ritchie, Salomon Rondon and Ayoze Perez — who scored 18 goals combined last season — is enough to account for the potential production lost from the young Serbian hitman. Fulham can find the net — it scored 1.57 goals per 90 minutes last season, the second most in the English League Championship, exceeding its expected goals rate of 1.47. Teenage phenom Ryan Sessegnon scored on 37 percent of the shots he took last season and outperformed his expected goals tally by 5.5, while Mitrovic — who impressed at the World Cup — contributed 12 goals of his own. Adding Andre Schurrle on a two-season loan will only increase Fulham’s firepower. The club also went all in on midfielder Jean Michael Seri, a player who has been linked to seemingly every big club in Europe over the past few seasons. And let’s not forget about Crystal Palace, the world’s 48th best team according to our SPI rankings. The Eagles got off to a historically atrocious start last season before righting the ship and finishing in the middle of the table. Additions Max Meyer and Cheikhou Kouyaté should help stabilize a midfield that had the eighth worst possession rate per 90 minutes last season, while Manchester United castoff Wilfried Zaha’s return to Selhurst Park continues to bear fruit. Zaha has scored 22 goals from the wing in the past four seasons, and at 25 years old, he is entering the prime of his career. The Eagles will likely go as far as Zaha can take them. Check out our latest soccer predictions. Spain’s top competition, La Liga, accounts for three of the top 15 teams in world soccer but 16 of the top 50. Watford spent some of that money to secure the services of Spanish forward Gerard Deulofeu on a permanent basis — for far less than Everton paid for Richarlison. Ordinarily, it wouldn’t be unusual for a team to go five seasons without winning the league, but United has been far from ordinary in the Premier League era: The Red Devils have won 13 times in 26 tries. One of the world’s greatest living talents, to be sure. Leicester was still playing in the EFL Championship then.